Over the past several months the WCS Archives has processed six collections, five of which are wholly or partially open for research. The finding aids for these collections have joined the descriptions of previously processed archival collections available through the WCS Library’s public website, www.wcs.org/library. 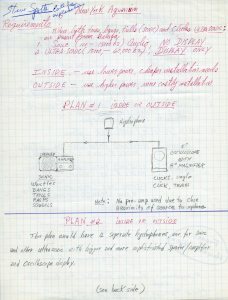 (The direct link to the Archives’ finding aids is: http://ielc.libguides.com/wcs/archives_fas.) Included below are the abstracts for and links to the collections’ finding aids, plus an image or document from each. Three of the newly available collections build upon the various New York Aquarium [NYA] collections processed in 2012 and 2013. Previously, we had processed collections of records pertaining to the Aquarium and its Osborn Laboratories of Marine Sciences as a whole, as well as to three of NYA’s Directors: Ross F. Nigrelli, George D. Ruggieri, and Louis E. Garibaldi. 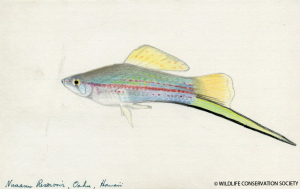 The three new NYA collections—which pertain to Directors Charles M. Breder and Christopher W. Coates, to NYA Fish Geneticist Myron Gordon, and to a group NYA senior staff—very nearly complete the Archives’ records of the Aquarium in the 20th Century. 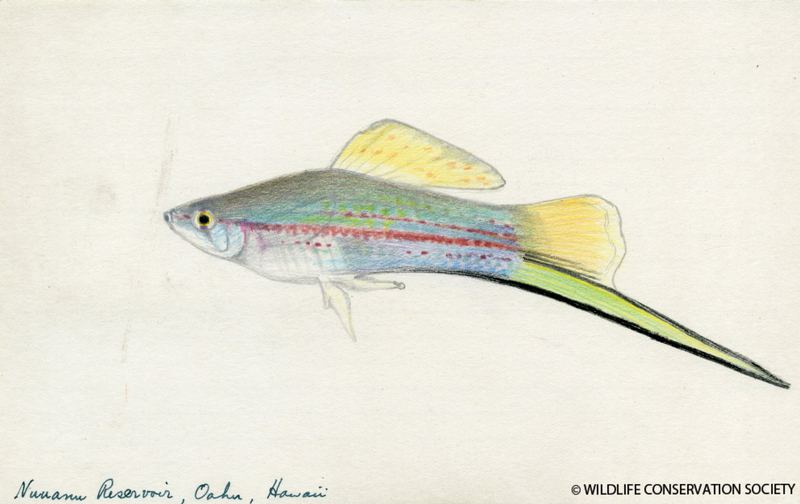 Myron Gordon illustration of a Hawaiian fish, circa 1950s. Myron Gordon records, 1900-1978 (bulk 1940-1978). Collection 3021. Wildlife Conservation Society Archives, New York. 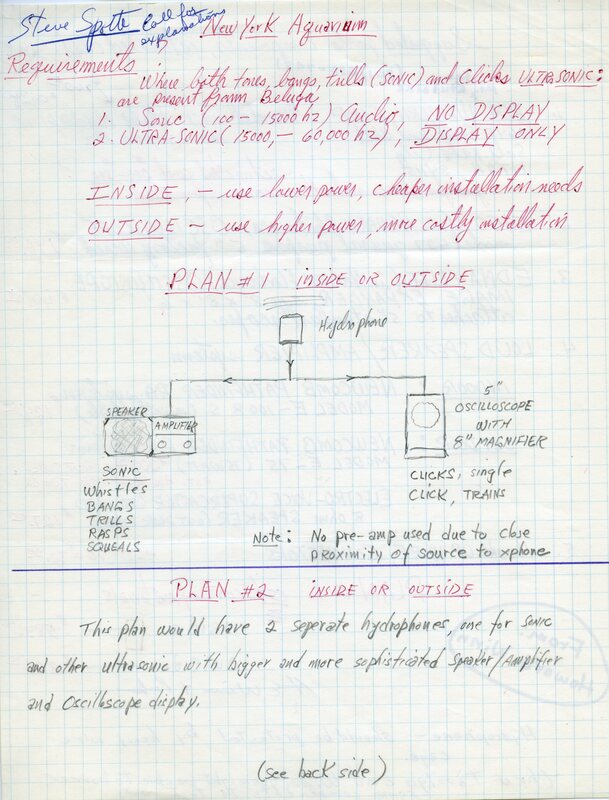 Notes on potential set-ups for hydrophones to project whale and dolphin sounds, circa 1972. New York Aquarium senior staff records, 1955-1979 (bulk 1964-1979). Collection 3054. Wildlife Conservation Society Archives, New York. 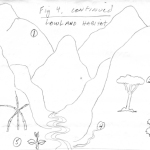 The remainder of the WCS Archives’ new collections may already be somewhat familiar to regular readers of WildThings: they were processed by the Archives’ interns Alexanne Brown, Kristin Moore, and Andrew Wong-Crocitto, who highlighted their work in posts on NYZS’s International Conservation bluebooks, the papers of Department of Tropical Research Associate Gloria Hollister Anable, and the records of Veterinarian Charles Gandal. Gandal’s records are closed, but as Andrew noted the collection consists mostly of the Veterinarian’s correspondence with his colleagues at the Bronx Zoo, other veterinarians, and the general public; this last category includes both pet owners asking for advice on how to care for and/or acquire exotic animal companions and young people asking about zoo veterinarianship as a profession. 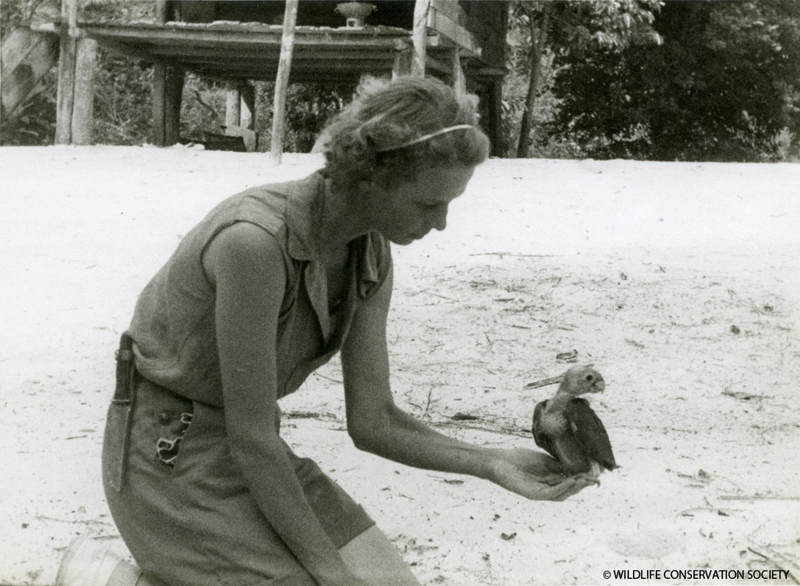 Gloria Hollister with Blue-Headed Parrot, circa 1936. Gloria Hollister Anable papers, 1914-2005 (bulk 1926-1947). Collection 1006. Wildlife Conservation Society Archives, New York. Detail from Bernard Peyton letter to Archie Carr and Mary Pearl, October 1st, 1985. New York Zoological Society. International Conservation bluebooks, 1962-1993. Collection 4041. Wildlife Conservation Society Archives, New York. Of course, processing work continues! 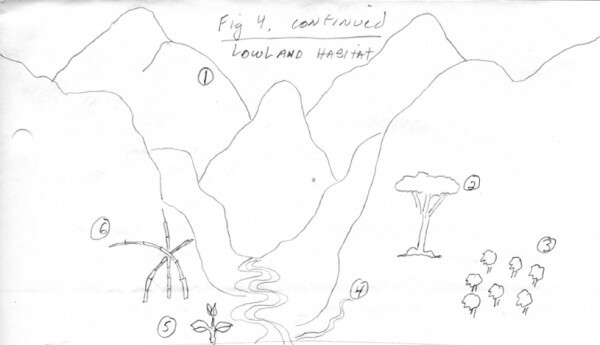 The Fall 2014 Archives Processing Intern, Helen Schubert Fields, is currently working on a collection of records from the Center for Field Biology and Conservation, a 1970s predecessor to today’s Global Conservation division. We’re also working on the records of the Ornithology Department from the second half of the 20th Century, and have a few other large processing projects on our plates for 2015. We’ll keep you updated on our progress!